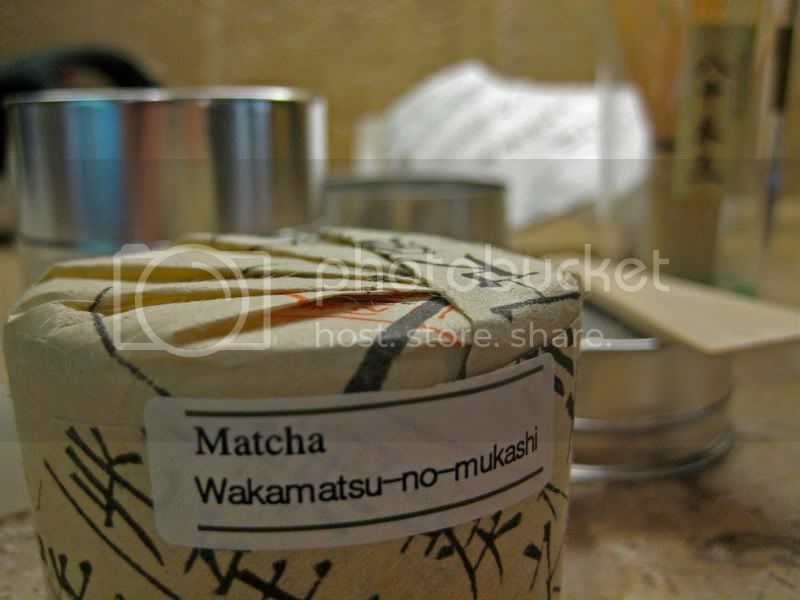 I recently ordered some Wakamatsu-no-Mukashi matcha to accompany my new chawan. I know they say not to judge a book by it's cover, but seriously, take a look at how fantastically this can is packaged! I am very pleased with Ippodo's style; the two other items I purchased in this order, a matcha furui (sifter) and a chasen (whisk), were also elegantly wrapped. This is a really nice matcha. It has an almost gummy mouth-feel; this is a really meaty (uh, not flavor-wise, don't worry) tea. It has a muted sweetness, in contrast with O-Cha's Kiri-no-Mori, and has a little kick of astringency. There isn't much to taste, really, but there is a lot to feel; between the mouth-feel and the buzz afterward (hmm, I wonder if this would fall under the qi umbrella? ), drinking this tea is a somatic experience. On the left, a new 100-tine chasen from Ippodo. On the right, my worn ~70 tine chasen from O-Cha. Here you can see what violent whisking does to a chasen. It took me a long time to learn not to scrape it so hard against the bottom of the chawan! It's hard to see in the photo, but there are several broken tines. 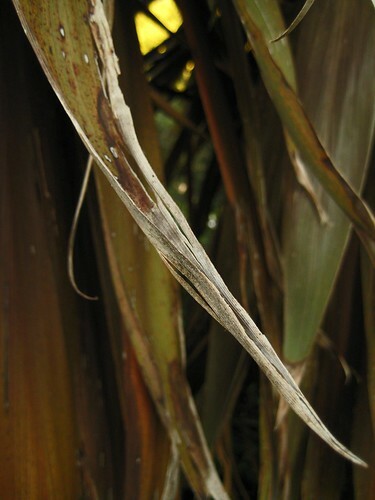 A palm frond. Fairly self-explanatory. I can agree with most of what you said while adding little of value -- the whisk is fantastic, the sifter is a real bust. I especially dislike the "persuader" tool that is included. 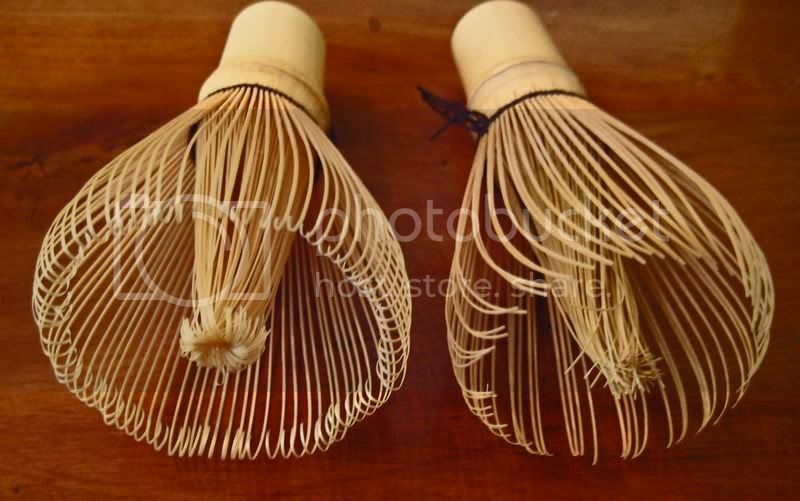 I prefer to use the backside of the bamboo scoop because you can squish down on the clumps from the top -- all the wooden thing really does is push the clumps around in the ring and it all gets compounded along the edge. That said, I really enjoy the taste and apparent quality of this matcha, but, I am having reservations as I have been having frequent headaches (more likely from intense allergies, but I am taking a few days off). Brandon, I also got quite a strong feeling from this tea, similar to how dehydration feels (though not quite as unpleasant), so it may not just be your allergies. I'll try it again when I know I have plenty of water in my system. I used that cute sifter and wooden device once and decided there had to be a better way. Though I don't have matcha more than two or three times a month, I keep it simple. I use a 55mm Metal Tea Strainer with Handle that I got from TeaGschwendner, though any fairly large size would do as well. I put the strainer in the chawan, put the tea in the strainer, and press it through with the back of the chashaku. The tea is sifted directly into the warmed and dried chawan, and I can rinse the strainer in water and not worry about rust -- Ippodo warns not to put their sifter in water. I use a little larger of those strainers to strain my shu directly into my shu cup which is too wide to accomodate the YSLLC metal filters I use for sheng in a smaller cup. Oh, BTW, it goes without saying that I enjoyed this lovely post and the ravishing photos! I wonder, has anyone tried shaking the sifter canister? Maybe I'll try that next time, hopefully it doesn't make too much of a mess. 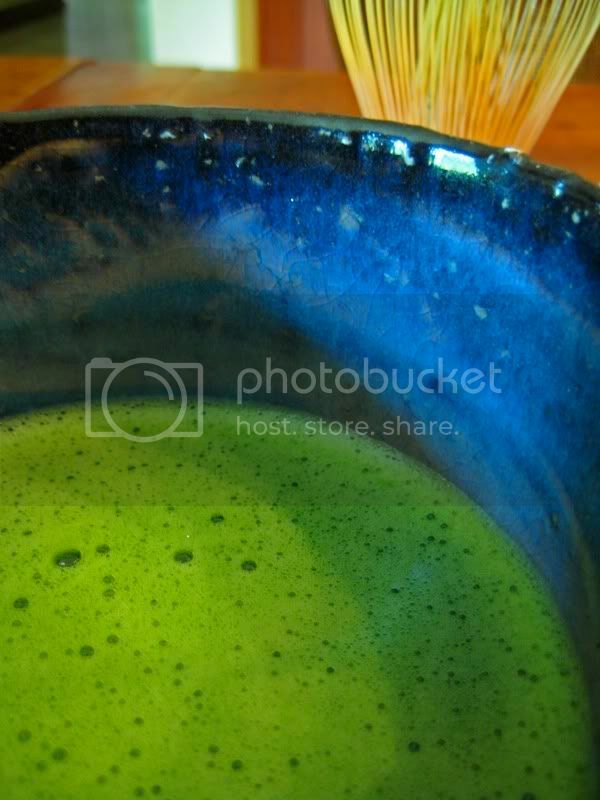 That matcha looks VERY green against the blue chawan. Please explain the difference between a 100- and 7-tine whisk, thank you. I must admit I upped the color saturation just a teense for color correction purposes. :D Still, it was very green, just as it is shown here. The number of tines is mostly a matter of school or personal preference, I think. I also seem to remember that chasen with fewer tines are used for thick tea, but I do not know if this is a rule, per se. I use a tea sifter similar to what's here. 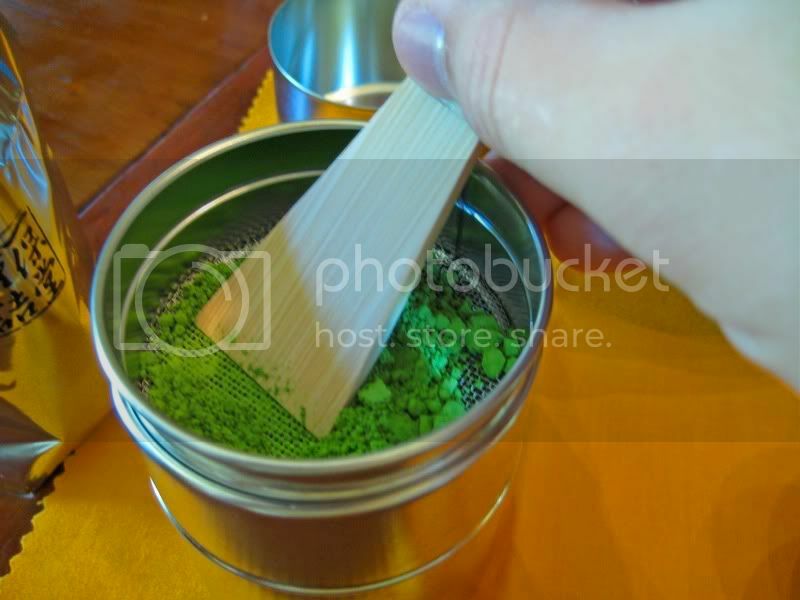 Without paying close attention, it does seem as if the matcha only gets pushed a round the top of the sieve and never goes through. But that's not true. It does. Just exercise patience.